Her sly humor was evident and there were times I might have missed the twist. “The idea of Tina Fey playing Sarah Palin was so fun to witness as she explains it well in her book, ‘Fifty Shades of Grey. '” It was like I had to do a double take… Fifty Shades of Grey? It was fun to get a peek into her life from a photo of one of her report cards to a picture of her with Hillary Clinton. I looked forward to each chapter. My sister in Boston and I both purchased this book, The Boston Girl. From the first page it capture d my attention. It is an historical novel written like a memoir with short chapters following in chronological order. This is the story about fictional Addy Brown, born at the turn of the century, as she told it to her granddaughter. I loved the descriptions, emotions and characters. I especially loved how speckled through the story you learned about life during those times. When Addy tries on her first pair of pants in 1917 she dreams of what she can do if she could wear pants. In one story she was on the very first Swan boat in 1926 and how later she took her kids there. I learned how child labor in the 1930s was very common, why it existed and the move to make changes in the laws. This made me feel like I was reading a real memoir. It is a New York Times Bestseller written by Anita Diamant the author of The Red Tent. Who are we… What we think… How can you categorize us?… What are we like when we think no one is paying attention?…. How do our words online create a profile? The book touches on our behavior as learned from the dating site… but also looks at attractiveness, racial issues and sexuality… and knowing that it wasn’t really controlled surveys, I felt a bit uncomfortable with those sections but it was interesting. I am not much of a left brain and I avoid numbers at all costs.. but I found this book interesting. Some of the conclusions are amusing, thought provoking and trivial. I am glad I read the book but I didn’t take away any real information that I can even share in this review… so maybe that says something!? 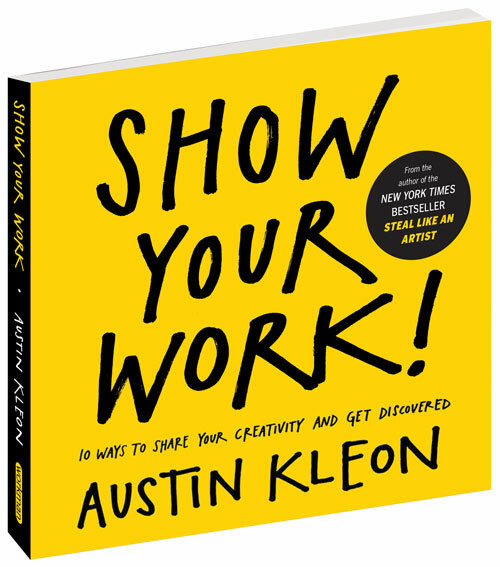 The book “Show Your Work” by Austin Kleon is an easy read that will get you motivated to to stop hiding! I call myself an “artist.” But, am I … really? I learned that I need to Show my Work! I saw a movie the other day called Finding Vivian Maiers. She will most likely go down in history as one of the greatest street photographers in the country in the last decade. Yet, no one ever saw her work. She took over 150,000 photos. Do I want to be a closet artist? Do I have a body of work to show? Who cares? Why? This book is really inspirational. But, what I also realized is that it is great advice for all the real estate agents that I teach. Get yourself out there and visible in the world. too many agents are just hiding. It is so important to let their prospects and clients what they do and how they work. So, go get this book! Let Go… Be Bold… Unfold…. 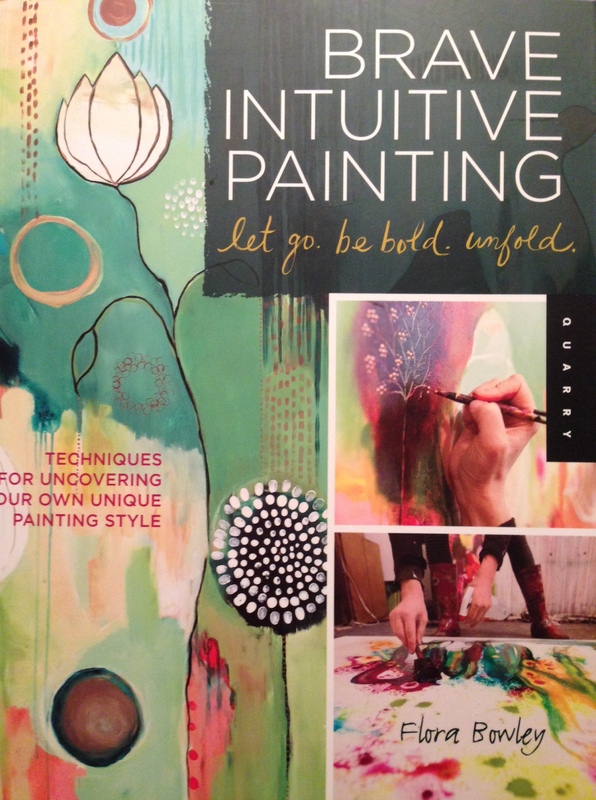 Flora Bowley’s book “Brave Intuitive Painting” is a burst of creativity. I feel like I stepped into her studio and had a personal conversation with her surrounded by her wild paintings and holding a paintbrush. I have this voice inside that tells me that I am not creative…. but I want to break out of my shell and be more creative and bold when I am in my studio. I love this book. What we want in sales is to bring about a delightful change in other people… by enlisting their own goals and desire, by being likable and trustworthy, and by framing a cause that other can embrace… You can change hearts, minds, and actions. 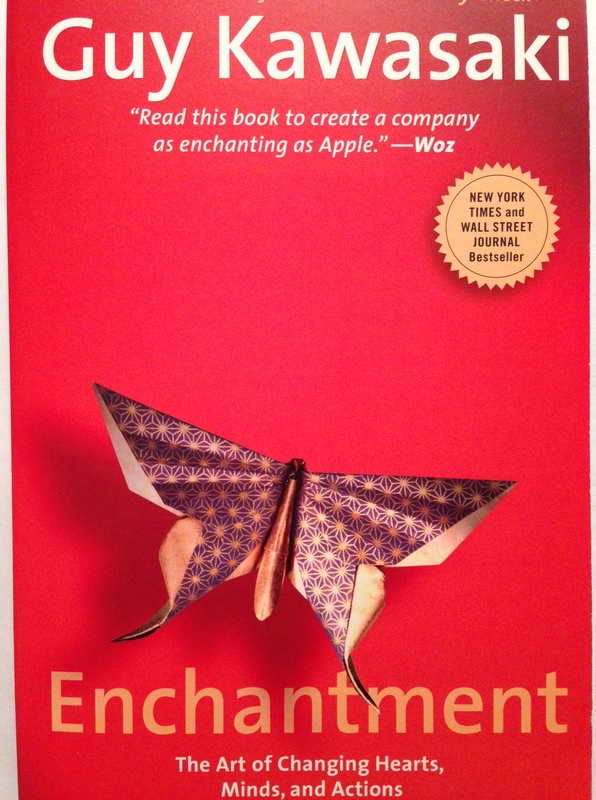 Guy Kawasaki, the author of “Enchantment” is a fascinating writer… he takes what we all really know we need to do but makes a case for not just promoting ourselves… but being interesting and fascinating to capture prospects. Though I have read so many marketing and social media books, this one is different because on almost every page I get an idea and a bit of motivation to do something new on all my social media. What did I learn to put into practice … “Promote Trial”(pg 60) … How can I promote my prospects better to “try” my classes? “Make it Personal (pg 132) How can I make my clients see my business as an extention of me… and communicate more directly?This is agreat book to just have on your desk or tablet to refer and get inspiration. 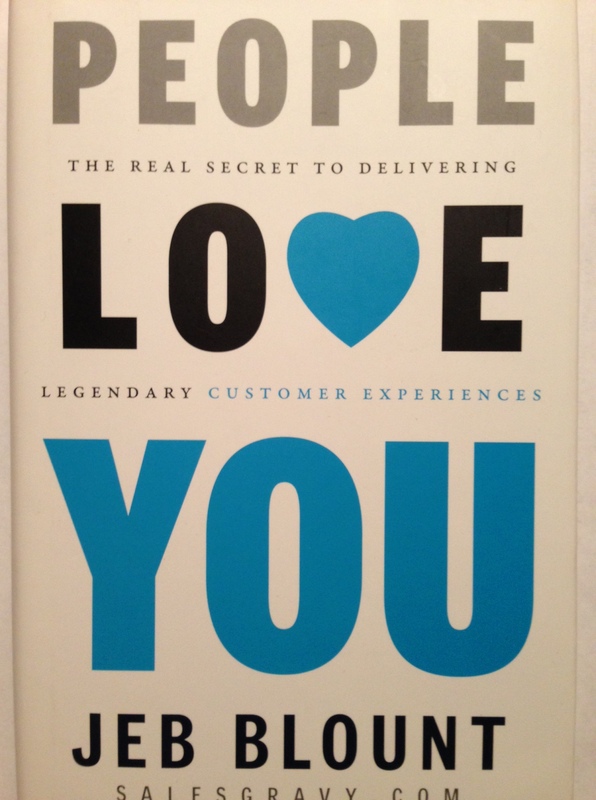 Jeb Blount wrote this book “People Love You” to remind us how to creat legendary customer experiences. Everyone of us in business knows that customer service… the relationship with our clients is the key to our future business… yet we can all be better and creating that engagement that we need. Sometimes I tack for granted that my clients will come back or that they are satisfied… and I need to interact with them more. This book was a good reminder! There are books out there that can change the way you view your own world. They can teach, inspire, and motivate you! I have been so busy reading this year! Since I have my Kindle, iPad, and iPhone I can sync whatever I am reading across each! I can be reading several books at once… turn off my Kindle… and hours later pick up my iPad and continue where I left off! At home, I surround myself with books. Just like dinner… there are times I don’t finish them, they don’t read as well as they look, or their weight scares me off. But, I find some morsel to savor in just about every book I hold. Since I know many of you may not be able to read from my library, this blog will give you a little taste of what I learned from some of the books I have read. Comments Off on Read books! As a suburbanite, whenever I would drive into the city of Seattle I would stress over whether I was going the right way on a one way street, if I could drive on this street during prime time, wonder where I could find parking that wouldn’t empty my bank account, and wish I knew exactly where that building was that I was heading for. I never did look up! So, one day I signed up for a walking tour of the skyscrapers with the Seattle Architecture Foundation. I figured … “What better place to learn about these buildings!” For the past half dozen years now, I have been a volunteer tour guide for the Foundation! This book was a valuable resource! This book, “Seattle Architecture: A walking Guide to Downtown” by Maureen R. Elenga was written and funded in conjunction with the Seattle Architecture Foundation. See a building in the city? Well, you most likely will find information on it in this book. It is organized into 9 sections of areas of the city with micro maps marked with numbers relating to the notable buildings in the section. I think it is important to get to know our city. These buildings show the history and tell a story about our city. If you want more information, email me about my next walking tour! Have a copy of this book whenever you are heading into the city. Spend an afternoon just walking down a block and looking up! Diane Keaton’s mother left her with 85 journals full of her writings, thoughts and collages. In the print version of the the book there are about a dozen photos with some samples of the pages. They are precious. In her memoir, “Then Again,” Diane writes about her mother’s journey alongside her own. I could hear her mother, Dorothy, talking through her writing.. her challenges, doubts, concern for her children, issues with her husband, and her struggle with depression and her own place in life. And then I hear how Diane felt reading her mothers words so many years later and looking at the direction of her own life as a mother, actress and woman in today’s world with different expectations and rules. Instead of a long term marriage, Diane had numerous love affairs with famous men but in her middle age as a single woman adopted two children who are the center of her life. It was an absolutely fascinating memoir. 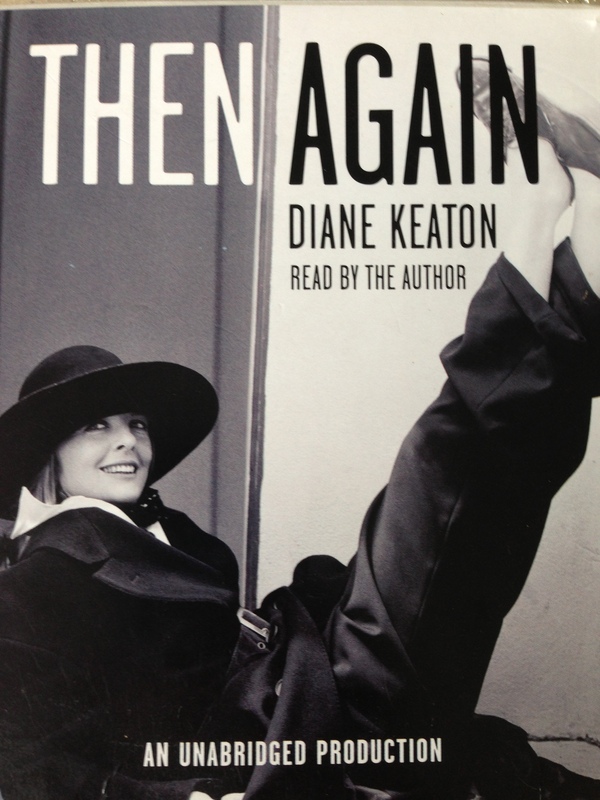 I am listening to the audio version this year read by Diane Keaton. Instead of reading the pages quickly, I am drawn to almost every word as the stories are carefully told. If you like memoirs, this is a book not to be missed!